Slip and fall incidents in California result in hundreds of serious injuries every year. Personal injuries can be a result of a number of reasons, such as spilled chemicals or liquids, improperly waxed floors, or obstructions in the walking area. Many types of bodily harm or even death may occur as a result of a spill on an uneven or dangerous surface and to get the compensation that you need for present and future medical expenses and pain and suffering, it is important to have an attorney that is experienced in handling claims involving mishaps that result in a slip or trip incident. According to the CDC, there were over 15,000 people that died as a result of falls within a one year period. Furthermore, falls are the leading cause of non fatal injury in the United States and account for more than 780,000 hospitalizations and better than 11.5 million minor injuries which do not require hospitalization. Many of these injuries are caused by acts of negligence by property owners and managers. Of those that are injured from slip and fall accidents, many sustain fractured bones, Traumatic Brain Injury, head injuries and back injuries. If you are injured from a fall, it is very important that you immediately seek medical attention. There may be injuries that cause serious medical problems at a later time that you are unaware of. Moreover, if the injury is an act of negligence on the part of a property owner or manager, having medical documentation will provide professional evidence to substantiate your case if you so choose to file a claim for injury settlement compensation. What Is The Legal Standard For Whether A Property Owner Is Liable For the Accident? Under California law, “A person who owns, leases, occupies or controls property is negligent if he or she fails to use reasonable care to keep the property in a reasonably safe condition.” A person who [owns/leases/occupies/ controls] property must use reasonable care to discover any unsafe conditions and to repair, replace, or give adequate warning of anything that could be reasonably expected to harm people that come onto the property. Various factors can be considered in making the determination as to whether there was “unreasonable” conduct including the following: The likelihood that someone would come on to the property in the same manner as the injured party did; the likelihood of harm; the probable seriousness of the harm; and whether the property owner or manager knew or should have known about the condition. Why Is It Important to Consult and Retain An Attorney as Soon as Possible After the Mishap? In order to determine if there is a case and to make sure the proper proof can be made regarding such a claim, it may be necessary to test the walking surface, inspect and photograph the area where the spill occurred. 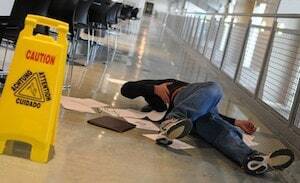 A slip fall lawyer can analyze the accident scene and even hire experts to conduct testing on the floor surface, measure stairways, or conduct other forensic work to determine if the fall was the result of negligence on the part of the property owner or business manager. For these reasons, it is imperative to speak with fall lawyers sooner rather than later on these types of personal injury claims. Call us today for a free consultation regarding any accident or injury on residential or commercial property related to a slip, trip or other fall or injury related to dangerous furniture, protruding objects or other dangerous conditions, or complete our online contact form without delay. We recently represented the family of a man who, unfortunately, sustained a fatal fall on black ice in front of a strip mall walkway leading from the parking lot to the front entrance of a store. Through thorough investigation, we were able to determine that the condition had existed for several days, the property owner and maintenance personnel had been informed of the condition and failed to either remedy the slippery surface or adequately warn pedestrians of the danger. This resulted in a resolution for the family in excess of a million dollars.